The second ever Wharfedale Art Competition was held on Saturday 3rd November at Ghyll Royd School. 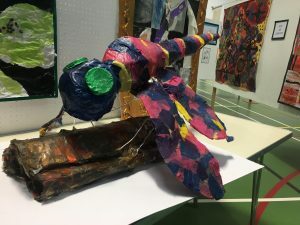 Artwork from Ghyll Royd School, Ashlands Primary, Burley Oaks Primary, Menston Primary, and Moorfield School pupils was displayed around the Multipurpose Hall for viewers to marvel at the work of young, budding artists. There was a fantastic range of work on display this year from a life-sized 3D Tutankhamen; paintings and art from children as young as 2; beautifully detailed pencil drawings; to a team of galloping horses. Local artists Kerry Stoker and designer Jo Duerden kindly leant their time to come along and judge each category, choosing a first, second and third place for each – which proved a very difficult decision process! The judges had a lot of fun seeing what the children had produced during their school art lessons, and were overwhelmed with the quality of work. We also had a viewers’ choice award which was decided by visitors to the exhibition. The winner of the viewers’ choice was Katie W’s brilliant Lowry painting from Ashlands Primary School!